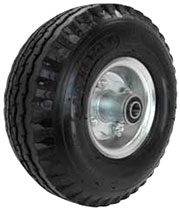 BuyCasters' Full Pneumatic Air Filled Hand Truck Wheels come with outer tire, inner tube and are mounted on an offset rim/hub for Hand Trucks & Portable Equipment. Pneumatic wheels offer the maximum cushioned ride available and easily roll over debris and small obstacles, great for both indoor and outdoor use. They provide good floor protection and quiet rolling operation. These black tread wheels can mark floors. Rims are made out of high quality heavy duty metal, offering exceptional reliability.